It is 3 am, I just finished packing my suitcase and can’t even think about sleeping since the performance a couple of hours ago of the Second Shostakovich Concerto was rather disturbing for me. My 8-year old son Janos said of the second movement, that it was scary – and so was more or less the whole concerto. I felt incredibly sad while playing – don’t know if it was the music itself, my pitiful playing or the presence of my poor ailing mother in the first row (must have been the first time she ever sat so close). Actually, this is now really false modesty – I felt pretty good about the performance, no major mishaps and at least to me it felt rather intense and “deep”. But again, who knows, often us musicians think we are doing something special while the audience is falling asleep. Anyway, about 45 minutes before the concert started – I was just changing at home into my concertclothes – my US manager called and asked if I was up to replacing Ha-Na Chang with a solorecital in Montreal this Sunday. I asked her to give me until after the concert to think about it. Kodaly Solosonata and two Bachsuites shouldn’t be a problem, played it so many times, but I was looking forward to a nice weekend with my son Janos; we have tickets for Berlin’s Basketball team versus Moscou, and on Sunday two tickets for the theater, the Persians by Aischylos. Besides that I was planning to practice a lot and do a bike tour with the little man. At the same time I am not only a musician but also somebody who loves challenges, and last-second replacements (well, I’ll arrive 24 hours before the concert in Montreal and only then I’ll be able to practice for the concert) are always fun, because the challenge of preparing in the very last second with travelling involved releases so much Adrenalin, that one probably could get high from it. But now, tickets bought and concert confirmed, I am suddenly doubting my decision; I completely forgot that the next week is actually really stressful for me: Rococo Variations with Leipzig Gewandhaus (and radio) while rehearsing in Cologne for a Dvorak Concerto with the GÃ¼rzenich and the excellent German conductor Markus Stenz, whom I know since quite some years, but it will mark our first collaboration. That means I will have already lots of flying back and fourth between Leipzig and Cologne, and no time to actually prepare the stuff for November (Britten, Pintscher, SchÃ¶nberg). Was this now a bad decision, completely overestimating my own resources, or will I rather strive on the pressure and the stress of running back and fourth? And the music? Will it suffer, will I play like an exhausted, hunted down little animal? You are a young vibrant cellist with a vast amount of music under your fingers,you will survive just fine.You have a wonderful sense of style, making your music a real pleasure to listen to.Do all that you can to bring joy to the world while you are young and able.Slow down when you are an 85 year old clone of Casals, and find your self moaning before and after every note of the Schumann concerto. HAHA! Looking forward to your return to Louisville. Record the Bach Suites as soon as possible.Don’t wait 5 to 10 years as you stated in one of your other blogs.Do it now,and then 8 to 10 years later do them again, and again when you are about 60 years old,by then you will perfect your style in them, and you can see how much your approach has changed over the years.If you wait too long you will see that the fist recording will just as unsatisfying to you, as you would if you do them now.Get over that first hurdle. Well, I attended your concert in Montreal and am very glad that you accepted the challenge. It was a wonderful performance and you charmed the audience with your introductions to the pieces. I hope the Ladies invite you back, on purpose. My only regret? You didn’t also play the Ligeti piece for solo cello. I looked briefly at your discography and didn’t see it, but it would fit right into your repertoire. Thank you again for a delightful afternoon! actually I am also happy now that I made it to Montreal – it was absolutely worth the effort. Wonderful audience, great hall (and a nice reception afterwards). You can watch a bit of the Ligeti in the video of my homepage, yes, it is in my repertoire, and yes, it fits extremely well as encore, both movements by the way. I am using them often as encores also after concertos – great piece, isn’t it? Next time I come to Montreal, I do the Ligeti, promise! Thank you for making the effort to come to Montreal on such short notice. You provided a wonderful and unexpected musical gift for your audience here. I hope the journey was worth it for you and that the standing ovation and sincere appreciation of a knowledgeable audience will have buoyed and energized rather than drained you. I very much enjoyed your performance of the Bach cello suites as music to which one could actually dance and look forward to adding your recording of them to my collection soon. I did not know the Kodally and enjoyed your playing of it enormously. Thank you for introducing me to it. I understand several members of the audience left after the Bach on the grounds that the Kodally is a boring piece. That probably means that they have not heard it played well, and it’s a pity they didn’t stay to enjoy your marvellously sonorous and narratively intelligent performance of it. The Rostropovitch encore was a brilliant choice to follow and made him very present in that small space. 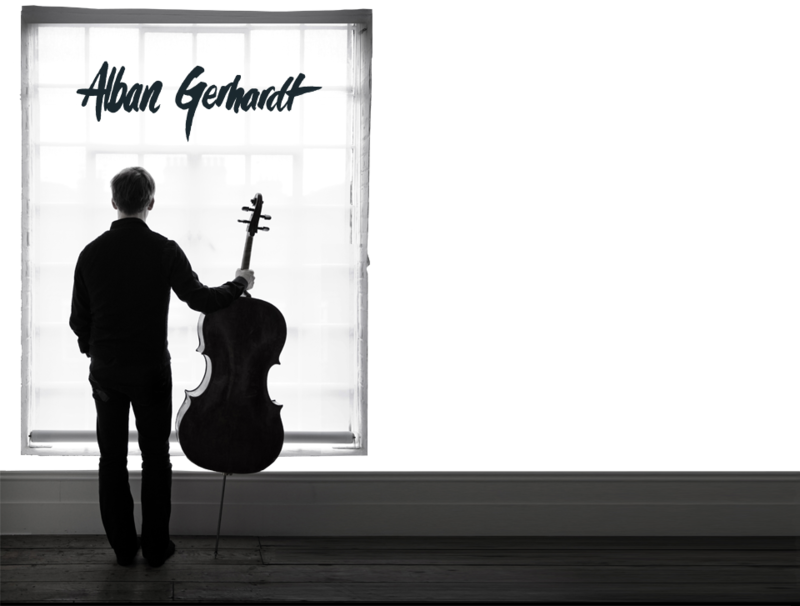 Hello Alban Gerhardt: I attended your Montreal performance and I thought you were really wonderful. My husband Brian Cherney is a composer who has written several pieces for solo cello (two were written especially for Antonio Lysy) and we would like to send a couple of scores to you. By the way, we were in Berlin last November when a choral work that Brian wrote for the Rias Kammerchor was performed. May we send you a few scores? If so, to which address should we send them? Looking forward to hearing from you and again — bravo and congratulations on the stimulating and exciting performance of the Bach and Kodaly in Montreal. oh yes, I loved my short little stay in Montreal, what a beautiful city, absolutely worth the effort of flying across the Atlantic for not even two days. I adore the Kodaly, didn’t realize people left before that, their loss, because it’s one of the greatest pieces for cello solo. But maybe they just hated my Bach so much, that they couldn’t be bothered by more Alban… Thanks for your sweets words! Hi Thomas, I hope you liked the Dvorak, probably quite a different experience to cd – on cd’s the balance is often wrong: too much cello, not enough orchestra, so I guess you were shocked by the softness of the cello. Oh, the Britten is a marvellous piece, just the first movement is a bit grim, but if one follows Brittens rather exact instructions, it comes out actually extremely beautiful. And the SchÃ¶nberg is completely tonal, based on a Cembalo concerto by a baroque composer, Monn. So don’t be afraid of that kind of music, some of it is most gorgeous. But I am glad you liked my one solo recital of the year! P.S. : Loved your interpretation of “silent woods”! I don’t know if you remember your Montreal debut with the Montreal Chamber Orchestra in 1992 . . . I was delighted to see that you were playing a recital in Montreal but unfortunately was unable to attend. Hi Thomas, yes, I agree, the Dvorak is much rather a symphony than a typical concerto – if it came across that way, I am happy! Hi Wanda, yes, I remember my debut with you 15 years ago – gosh, how time flies. Hope all is well in Montreal, I enjoyed my time back then very much (now I didn’t have much time to enjoy this beautiful city). I heard you play in San Diego some months ago … the best cellist I’ve heard so far live. I know this comment does not belong exactly here, but I don’t where else to put it. Anyways, keep up the great work.